The Board of European Students of Technology (BEST) is an organisation that dates back to April 1989, having as a main objective to connect European students with a healthy appetite for technology. With the help of more than 95 local networks reaching out to 1 300 000 students from 33 countries, it has become a reference to those who believe in European research, mobility, knowledge transfer and aspire to innovate. 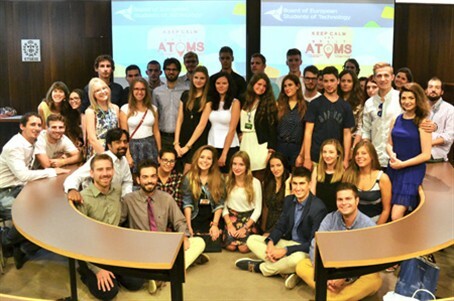 F4E was invited to open this year’s BEST seminar hosted by the Polytechnic University of Catalonia in Barcelona to explain the merits of fusion energy, the progress of the ITER project and the industrial and technological benefits that would stem from it. Dr. Jesus Izquierdo, working in F4E’s Technical Suport Services, kicked off his presentation with some data about climate change and energy consumption in order to make the case for more R&D in this field. “Today’s environmental awareness needs to be matched with intelligent energy choices. If we cannot consume less power then we have to empower tomorrow’s innovators. We have to lay the foundations for the widest sustainable energy mix…and this is where fusion comes in” he explained. During his presentation he teased out the competitive advantages of fusion energy, highlighted the progress of ITER components, projected short films of the ITER construction site and tackled the industrial challenges and benefits of the high-tech engineering involved. The debate lasted two hours and the 30 selected students attending the seminar had the opportunity to share some thoughts on the subjects of superconductivity, high-heat flux materials and power generation. The session concluded with one question: why has it taken so long to put fusion on the energy map given its potential? Thousands of scientists working for the ITER project are trying to answer this question day by day hoping to make this a real option.